Leave garage door cables service to us. Since these parts work hand in hand with springs, they are under tension too. Don’t take risks. Our company is only one phone call away and very experienced in such services. We provide same day garage door cables repair in Dallas and are prepared to help you with any related need. Give us a call if the cables snapped or have come off their position. Our pros here at Garage Door Repair Dallas TX will be on their way. It’s important to call our company in Dallas, Texas, for garage door cables repair as soon as you notice any problem with these parts. Are the cables damaged, off, or frayed? Do they seem to be loose? Trained and equipped, our pros have the skills and tools needed to fix any cable problem. 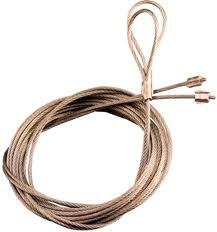 Although they are very strong, cables are actually wires connected to the spring system and wound to lift the door. Problems related to the springs, drums, or even the tension transferred might cause cable trouble. Over the years, cables wear and will eventually snap. Why call our team for garage door cable services? We have a long experience in cables. With equipped vans and the proper qualifications, our techs provide efficient garage door cables replacement and repair services. Whether your cables are broken or off their drum, we can handle the problem. It takes expertise to fix up cables since they are connected with torsion and extension springs in a different way but they are tensed either way. Our techs can replace your cables in no time flat. When we are installing garage door cables, we check the other side of the door too. Our pro will also ensure the door moves up and down properly and there is no gap under the door. We make all the necessary adjustments to ensure excellent door performance and safety. You can count on our Dallas garage door cables repair technicians to do an outstanding job no matter what you need. Do you have any questions? Want to install cables now? Got cable problems? Feel free to call us anytime for cable repair needs.